Cristiano Ronaldo’s Mercurial Vapor 4 vs World’s Fastest Car: Who wins? A new film from Nike Football showcases Cristiano Ronaldo’s phenomenal speed when he goes head-to-head in a speed test against the Bugatti Veyron. Shot at a secret test track in North-West England, the viral shows Ronaldo testing the new Mercurial Vapor 4 football boot which is specifically designed to improve speed with and without the ball. Ronaldo, one of the fastest football players in the world today, goes head-to-head against the Bugatti Veyron; the world’s fastest road car. Man v machine: who wins? In the film, Ronaldo approaches the starting line wearing his new football boots in preparation to race the Veyron. The car approaches, the gun sounds and Ronaldo gets off to a blistering start. The pace proves too much for the Bugatti as Ronaldo finishes ahead of the car thanks to a second burst of acceleration by the Manchester United & Portugese winger at the turn around. View the Ronaldo vs Bugatti Veyron video on the Football Boots TV player. Cristiano will wear the Mercurial Vapor 4 for the first time on Saturday during Manchester United v Newcastle United at Old Trafford. 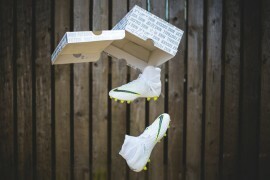 The football boot will then be worn by a host of international stars including Didier Drogba, Zlatan Ibrahimovich, Franck Ribery and Robinho. The Mercurial Vapor features Nike’s innovative Speed Plate technology designed to give players instant acceleration and make them fastest to and with the ball. The Mercurial Vapor is the fastest, lightest football boot available. I can meet Cristiano Ronaldo and i win neer i meet him. hez ma unc cnt u c d name Dos Santos Ameirez.